Alright, you primitive screwheads, listen up: a new Evil Dead movie is on the way. 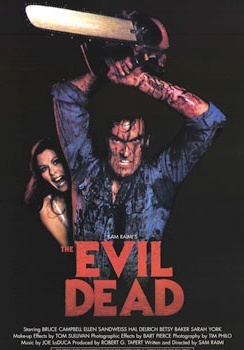 Talk about a new Evil Dead film has been kicking around for awhile but as is usually the case with such fan-powered hopes and dreams, there's been no real substance to any of it. Until yesterday, that is, when DreadCentral.com claimed "on good authority from a very reliable source" that Bob Murawski, an editor whose partnership with director Sam Raimi goes back to the 1992 flick Army of Darkness, was in Detroit to start work on a fourth film. Evil Dead 4, according to the report, will be "a small indie thing like the first two." That's good news, albeit still a rumor - but a rumor that got a big boost late last night by way of a tweet from none other than Bruce "Ash" Campbell, B-movie legend, best Elvis ever and of course the "hero," as far as that goes, of the Evil Dead franchise. "Believe in the remake, dawg!" he wrote. "The project is real. In the works. Cool as hell. Scary as hell." I'm not sure if the Evil Dead films qualify as scary, but cool as hell? Definitely. And a chance to watch Campbell smash things over his own head again? Take my money, please. UPDATE: In a follow-up tweet, Campbell clarified that the new Evil Dead film is in fact a remake of the original Evil Dead and not an all-new chapter. "Good people. My tweet was about remaking Evil Dead - not Evil Dead 4," he wrote. Campbell's role in the project is not yet known.